The 30-minute mayhem in the morning killed one in Chapainawabganj and injured over 100. Another boy was killed in a blast at Savar in the afternoon. Jama'atul Mujahideen Bangladesh, the banned militant group, claimed responsibility for the blasts through leaflets that left the countrymen in shock. Panic gripped the country at the extent of the network of the terrorists who meticulously calculated the timing of the bombings between 11:00am and 11:30am, targeting government establishments, mainly the offices of the local district administrations and courts. Only two hours after Prime Minister Khaleda Zia departed for China on a five-day official tour, a time bomb went off on the stairs inside Zia International Airport, showing a gaping hole in the security system. Three madrasa students and an imam of a mosque were picked up from the airport premises. In the leaflets, in Bangla and Arabic, found with the bomb devices, Jama'atul, which was banned on February 23 this year, said: "It is time to implement Islamic law in Bangladesh. There is no future with man-made law." Police randomly arrested at least 45 people including a Mujahideen leader in Satkhira for their suspected involvement in the attacks. Yesterday's attacks were only one in a series of blasts suspected to be carried out by Islamist militants in the last six years, all of which remain unearthed and their investigations halted midway. Immediately after the blasts that spared only Munshiganj district, State Minister for Home Lutfozzaman Babar told journalists that the attacks were carried out by an well-organised group. "It is not an isolated incident and done in an organised way with an objective," Babar said, but did not give details about the group. "We had intelligence reports of some attacks between August 14 and16, but we had no information of attacks on August 17," he said. Later in the afternoon, he shifted from his position and said the attacks were totally unexpected and the government was in the dark. He also asked all not to panic. In capital Dhaka, bombs exploded at 28 points including the high-security Bangladesh Secretariat, Supreme Court complex, the Prime Minister's Office, Dhaka Judges Court, Dhaka University, Dhaka Sheraton Hotel and Zia International Airport, Air Port rail station, a location close to the US embassy, police headquarters at Ramna, Hotel Sonargaon, Jatiya Press Club, New Market and the Bangladesh Bank. The bombs, sealed in tin containers with electric circuit attached, were wrapped with scotch tape. The bombs were left in public places in packets or bags. As they went off one after another, police forces rushed from one spot to the other, people started running for shelter not knowing what would come next. Rumours spread like fire and people tried their cell phones to get to know the situation of their relatives and friends. As the militants played out their firepower, the capital was in the grip of panic and insecurity. Many offices closed down, markets pulled down shutters, the stock market stopped trading for about an hour as prices crashed and parents scrambled to bring home their children from school. Soon after noon, the traffic on the roads thinned out. Paramilitary BDR, Rapid Action Battalion (Rab) and police forces were deployed across the country, while army troops were put on high alert at the Chittagong Hill Tracts (CHT). Check posts have been erected and vehicles are being searched. Army intelligence has started gathering information about the blasts with main attention on Jama'atul, sources said. Jama'atul Mujahideen is a group, headed by Islamic extremist Dr Asadullah Ghalib, who is now in jail on charge of bombing some NGO offices including Brac and Grameen Bank. The group was once led by Bangla Bhai, the infamous Islamist militant who spread a reign of terror in the northern districts before he disappeared recently. In Chapainawabganj, one person was killed and three others were injured in a series of near-simultaneous bomb blasts yesterday morning. Rabiul Islam, a rickshawpuller of Swarupnagar in Sadar upazila, was critically injured when seven bombs exploded at about 11:10am at Biswa Road crossing near Shah Niamat Ullah College in the northern district town. He succumbed to his injuries on way to Rajshahi Medical College Hospital. Three others injured in the explosion are -- Rabi Saha, a porter of Dariapur, Moti Rabi Das of Baliaghata and Ashok of Kalinagar. "A youth aged about 20 years kept a tiny paper-made box near us and went away asking us to have a look on it for a while. Within a few minutes it went off," said Rabi Saha before he fainted at Chapainawabganj Sadar Hospital. Six other bombs exploded almost simultaneously on the premises of District Judge Court, Bar and DC (deputy commissioner) office premises and New Market area in the town but no one was injured in the blasts. A 10-year old school boy was killed while another child injured when six bombs exploded in Savar. Savar police arrested one person in this connection. The minor boy identified as Abdus Salam, 10, died after rush to the hospital when a bomb exploded in front of his house. A 3-year-old Anik was also injured seriously in the incident. Anik was under going treatment at a local clinic. The bomb exploded at 3.00pm and he died at 6.00. In Chittagong, bombs exploded at 16 city spots including the Chittagong Press Club and the Bangladesh Bank premises, court building and near the Kotwali Police Station, injuring six people. Law enforcers arrested four suspected persons with three bombs and 12 chocolate bombs. Police also recovered few abandoned live bombs from different spots. A panicky situation has been prevailed in the entire city following the explosions. 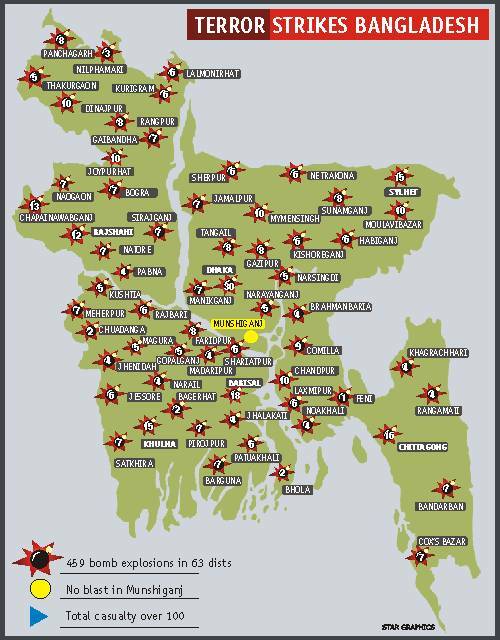 Other places where bombs blasts occurred were: GEC Intersection, Kazir Dewri, Karnaphuli Shah Amanat Bridge, WASA Intersection, Lalkhan Bazaar, New Market, Muradpur, Sholoshahar, Bohaddarhat, Dewanhat, Kadamtali and Chittagong City Corporation (CCC) premises in Anderkilla. Most of the bombs went off simultaneously with a big bang between 11:00am and 11:30am, excepting two spots at GEC Intersection and Kazir Dewri, where two bombs blew up at 9:45am and 10:30am injuring two. The injured were identified as Delwar Hossain, 13, Abdul Hai, 32, Md Ismail, 12, and Habibur Rahman, 60. They were undergoing treatment at Chittagong Medical College Hospital (CMCH) and General Hospital. The identity of others couldn't be known until around 3:45pm. Md Ismail, a mobile fruit vendor, got injured in front of a school just opposite to Press Club at around 11:00am. The bomb was kept in a shelf beneath his van. Rab arrested four persons with three live bombs and 12 'chocolate' bombs from Kadamtali area under the Doublemooring Police Station. They are Parimal Chandra, 30, of Patiya, Azizul Haq, 25, of Pahartali, Younus Khan, 47, of Anwara, and Joynal Abedin, 45, of Brahmanbaria. In Rajshahi, at least 12 bombs went off at eight points --three on the court and DC office premises, one each at Kajla Gate of Rajshahi University, Rajshahi University of Engineering and Technology, RDA Market, Laxmipur, New Market, Gourhanga crossing, Shalbagan Bazar, Naodapara areas. One unexploded bomb was recovered at the DC office premises. Police picked up five people for interrogation from the blast sites. In Khulna, fifteen bombs were exploded in 13 places, but no one was hurt in the blasts. Four persons were arrested from the city, but police did not disclose their names. The entire city has been put on red alert and a huge number of armed police and members of Rab has been deployed at all key points and installations. All madrasas have been cordoned by police and Rab. In Sylhet, at least 15 bombs went off in the city yesterday morning while 3 live bombs were recovered from two places. The series of blasts took place from 11:00am to 11:15am in the public places including five small and roadside shrines in the city. However, only three persons received splinter injuries and were admitted to Sylhet MAG Osmani Medical College Hospital. A private car was seized at the city's Rikabibazar area as someone is said to have thrown a bomb from it, a police official said. The driver, Babul Miah, 30, has also been caught. Of the injured, Habibullah, 35, of Biswanath, and Quamrul Islam Siddiqui, 20, of Sunamganj sustained minor wounds in their legs in the Judge court blast while Matilal Dhar, 25, of Lamabazar sustained injuries in his head at the Ambarkhana blast. In Barisal, A series of bombs exploded at least 18 points of the city injuring four people. Seven live bombs were recovered from the blast spots. Barisal Kotwali police detained three persons. They were Manir Howladar,30, Alauddin, 34, and Yunus,28. Senior ministers yesterday sat in an emergency meeting to review the consequences of the countrywide blasts and decide what to do. Finance Minister M Saifur Rahman, Health Minister Khandakar Mosharraf Hossain, LGRD Minister Abdul Mannan Bhuiyan, Political Advisor to the prime minister Harris Chowdhury and State Minister for Home Lutfozzaman Babar attended the meeting held at Saifur's Sher-e-Bangla Nagar office. Intelligence agencies briefed the ministers on yesterday's bomb blasts. The meeting took some decisions about steps to take in the face of yesterday's incident.